As Rachel from the show Friends, Jennifer Aniston’s hairstyle (known as the Rachel) became one of the most emulated hairstyles of the 90’s. Aniston’s style off-screen, however, has garnered just as much praise for its accessibility. The value behind Aniston’s look, is that she appears on-trend and chic without attempting to be on-trend or chic. Every look feels absolutely natural and unforced. Beyond that, she looks put together in the most effortless of ways. In this post, we break down Jennifer Aniston’s girl-next-door glam and put together a wardrobe inspired by her southern Californian style and charm. Simplicity and taste would be the two leading words to describe how to achieve the Jennifer Aniston look. However, don’t let her appreciation for a simple approach to dressing fool you. Aniston is known for getting even her t-shirts tailored. What she understands is that every piece must fit extremely well to be as flattering as possible. Furthermore, if you look through numerous photos of her off-camera style, you’ll notice repeats of pieces combined in new ways. Her style is practically a capsule wardrobe waiting to happen. Working with a very neutral palette: Aniston does not shy away from all black, however, the bronzy take to her hair, golden accessories, and glowing makeup help to keep all black looks from becoming too overpowering. Appreciating denim and khakis: Most of her off-screen, streetstyle consists of tailored jeans and khakis that fit incredibly well. She pairs them with everything from leather jackets to longline dusters. Golden tones: Part of Aniston’s appeal is how she exudes southern Californian warmth. She opts for bronze and golden tones through her makeup, hair, and accessories. Put a hat on it: She loves panamas, fedoras, and wide brim hats. They are extremely flattering on her frame and are an accessory that brings the whole look together. Keeping yourself healthy: Aniston has the type of body envied by almost every age group. She is a big advocate of staying healthy, and wearing pieces that flatter her body shape. This confidence shines through whether she has on a pair of jeans or a $10,000 evening gown. 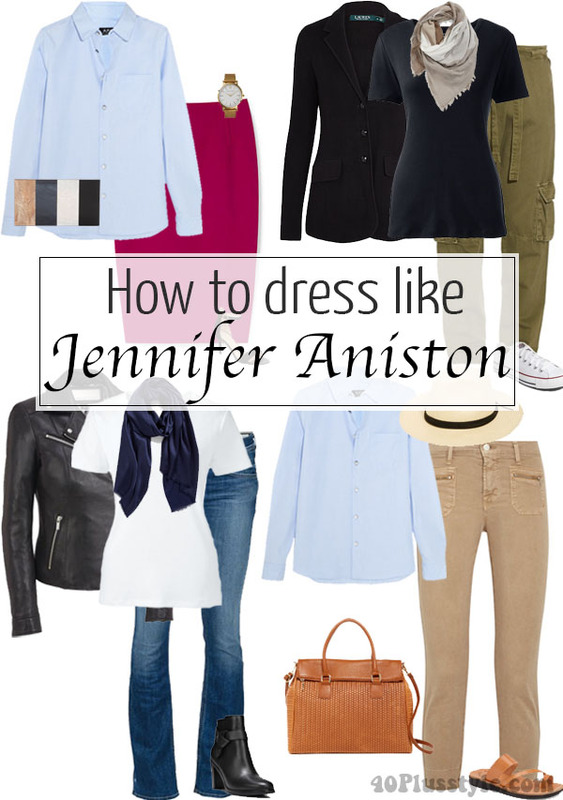 Get inspired by an Aniston capsule wardrobe below. Are you a fan of Jennifer Aniston’s style? I love Jennifer Anniston’s style and have for years. Even sported a modified “Rachel” for a short time back in the day. Do you notice one thing she rarely wears? Skinny jeans. Occasionally tucked into knee high boots, but I don’t think I’ve ever seen her wear them any other way. I try to think of her whenever I wear my not so trendy but oh so much more flattering (for me) bootcut jeans. It can’t be completely out of style as long as Jennifer is still doing it, right? 🙂 It’s interesting how her clothing choices are almost boring yet she always looks great. And you can’t tell what year it is by looking at her photos. I like her style but she is nowhere near like me. So I will stick to my own style . Loved that black skirt with ruffles but it was too short. I like Jennifer’s style and over the years many of my own looks resembled hers but lately I’ve found too much of a sameness with this style. No pops of color, little jewelry, not minimalist but not too interesting either, just a bit boring. I like what I’ve learned from 40plus style and can see how it elevates my personal style. Love Jennifer ‘s style. So much of it is classy yet casual. She makes everything look good no matter what it is. I don’t think so. She wears a variety of brands. Thank you for this post Sylvia. I am wondering if you had a post on his to dress during menopause? I can’t find it if you did. What an awful time…. I need pj’s and tops. Any links for shopping those items? I would be grateful. Hi Cindy, Yes I do. 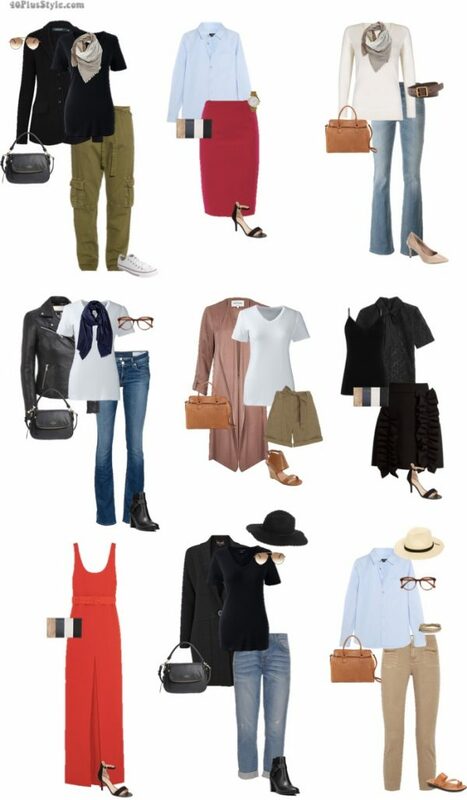 You can find it at https://40plusstyle.com/how-to-dress-for-menopause-for-hot-flash-relief-8-essential-things-to-do/ There are some links mentioned there. Good luck!